An earthquake seemed overdue in the Kathmandu region. That’s what my friend and colleague Dawa Chhiri Sherpa and I were discussing the morning of April 25th, 2015. We were planning out our week in Kathmandu before we were due to fly back to Lukla for the Everest base camp trek. 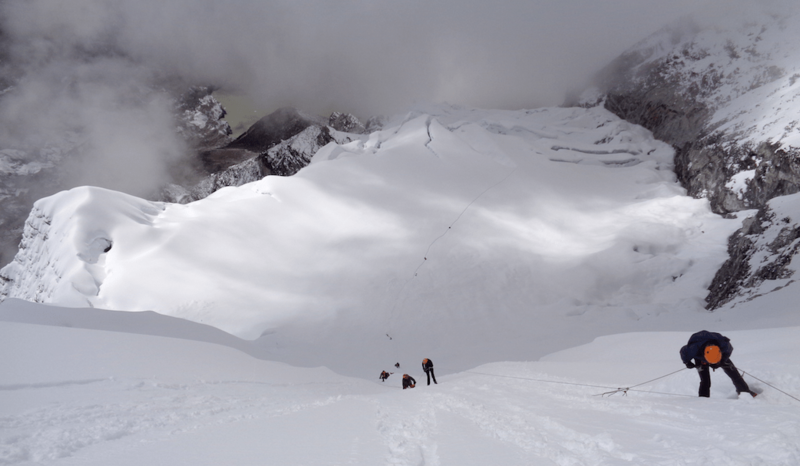 I had just returned from Island Peak at 20,305ft and felt ready for a break before heading back into the mountains. That morning I could barely get out of bed. We had been up at 6 or 7am each morning for the past three weeks and 9am came and I was struggling to get up. I noticed Dawa out watering plants so I went outside. He had been up since 5am as he dropped our head climbing Sherpa, Ang Kami, to the bus station. Ang Kami was heading back to Goli where his wife and 3-year-old baby lived. Ang Kami was going for a week before he would head back to the Everest trail with us. 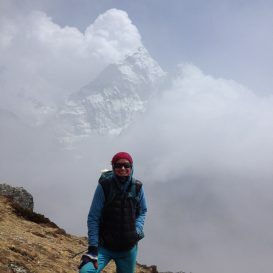 All of our staff come from the same village in the lower Khumbu region below Everest. Dawa made me coffee and boiled eggs and offered me a shower. I took my time getting ready then we headed to the Monkey Temple to have another look around and relax with another coffee to wake me up. We jumped on the motor bike down the alley and were off to the Swayambhunath Temple. We walked up the steps and observed the sights, commenting on how busy it all was. There were numerous small fires and I remember Dawa rushing to help put out a woman’s dress that had caught fire. We enjoyed our coffee and talked about a range of things including earthquakes and how Kathmandu was at risk for landslides on the trails. After our coffee we headed back to Thamel. Dawa dropped me off at the hotel where everyone was staying and started to gather the troops for a trip to the Royal Palace and Durbar Square. We were delayed leaving as we were waiting on Paul to come down to the lobby. Thank God he was late. If we had left five minutes earlier we would surely have been under buildings which came down around the corner from the hotel. Sitting in the lobby of the hotel everything slowly started to move. Then all of a sudden we were being thrown around. We managed to make our way to open ground and struggled to even stand at times. There was a moment when I felt the hotel would come down but it didn’t. After the initial shock and rock of the earthquake and trying to understand and realize what had happened our concern turned to the rest of our team in the mountains and friends out throughout Kathmandu and Nepal. We ran to see if we could help and realized we were in more risk as there were aftershocks, some big. We moved back to the hotel and open ground as we were in no position to help at that point. Our focus stayed on our friends. Ronan and Magda were out on the street shopping and sightseeing, hopefully not in harm’s way. I was also thinking about our staff and Sherpa friends who were scattered around Kathmandu and further afield. There was surprisingly little damage to our hotel but when I finally ventured out in search of Dawa and his son Sonam, I could see a lot more damage and fallen buildings and worried for my safety as I walked over crumbled buildings. Just getting out of our area was challenging; no roads were accessible. The street of their home and our office was blocked. The entrance to their place was covered with no way in. As I neared the entrance to where Dawa’s home was, a man wailed nearby. His whole family was in the house that came down blocking the entrance to Dawa’s home. We saw our Sherpa friend Phurba and Dawa’s cousin Tendi. Phurba said 18 people were in the building. With no sign of Dawa or Sonam and after walking around the area for 45 minutes, we decided to make our way back to the hotel and make sure Ronan and Magda arrived back at the hotel safely. We waited on open ground at the hotel. Ronan called, saying they were safe. Four hours after the initial earthquake they arrived back at the hotel. An hour later Dawa showed up as well, to our relief. That night we had wifi and I spoke to my wife and a couple of newspapers, explaining what I had seen and what was happening on the ground in Kathmandu. It was unclear what the response would be and how quickly it would come. The first four days after the earthquake were bad—no water, food, electricity, information or any word as every three hours we would be rocked by tremors. Trying to get everyone out of the country and get information from our Mera Peak team were very challenging. By April 29th things were starting to move again. Although we still had no water or electricity, we needed to help. All of our clients were back in Kathmandu and preparing to go home. Dawa and I decided to go out and help people. So for three days we did that. We saw horrific scenes and people in need. Bodies still on the street near Thamel, the tourist district. People in large camps desperate for water, food and basic necessities. Once we had given our time, resources and money we starting thinking about how I might be able to go home and how we could find out how Ang Kami was and if Dawa’s village, Goli had withstood the earthquake. 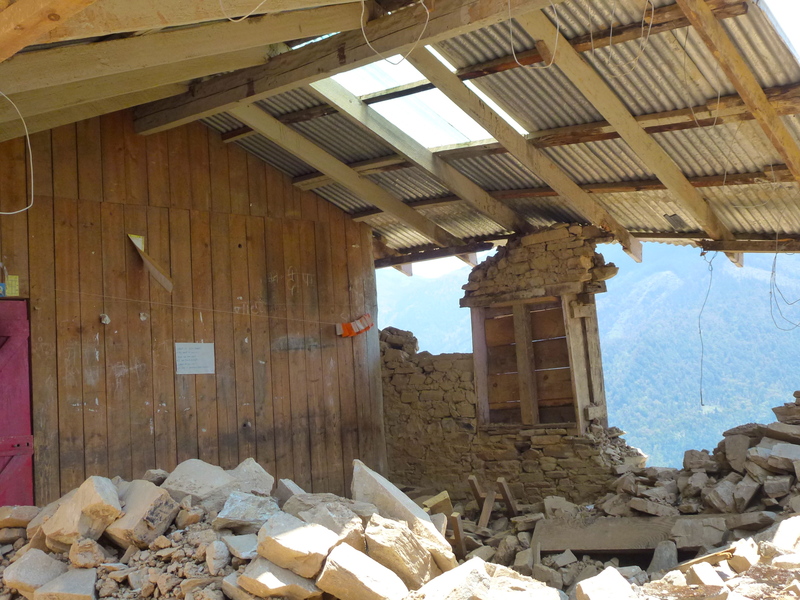 Word came through that the village of Goli below Pikey peak in the Everest region was in ruin and we now had to think of ways to help these people in this nearby village which has been so good to us. We had been helping them send up stoves over the last couple of years but now it was time to make things happen. I left Kathmandu on May 1st. Dawa left Kathmandu Saturday morning on a long 10-hour bus ride with food, tents, water and supplies, not knowing what he would find in the village where he grew up. We will now raise money for Dawa’s village, hopefully bringing a little hope to the people. My earthquake experience in Kathmandu left me with the clear understanding that people need help and I had a responsibility to raise awareness and help in a remote part of Nepal. After the devastating earthquake that hit Nepal in April 2015, many people from around the world have reached out to us wanting to help the local people. All our local Sherpa staff come from the village of Goli, which is located 109km/68mi east of Kathmandu. 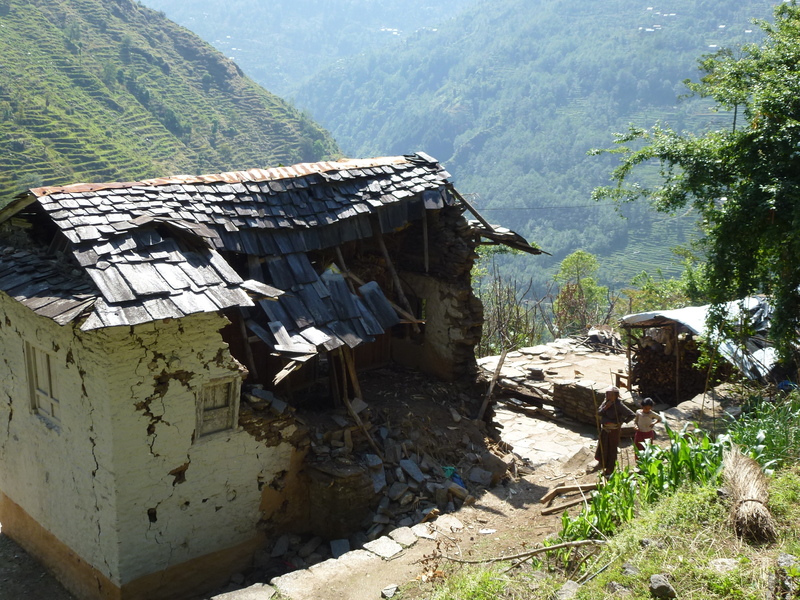 The village of Goli has 456 homes spread across spectacular valleys, and many of the homes are badly damaged or have completely collapsed. Learn about our Goli School Project, here! We are working to help rebuild this beautiful village that is home to many of our coworkers and friends. In addition to donations, you can visit the village and experience the hospitality this amazing village offers. Goli village sits below Pikey peak, at 4,065m/ 13,335ft, and has some of the world’s best mountain views, which are not to be missed. You can see Kanchenjunga in eastern Nepal right across to Makalu, Everest, Lhotse, Cho Oyu and all the way to the Annapurna range west of Kathmandu. With funds we raised from a wide range of events in the United States, Canada across Ireland, Europe and the UK we have been able to secure funds to start rebuilding in the village of Goli. If everyone does a little, we will see real change. 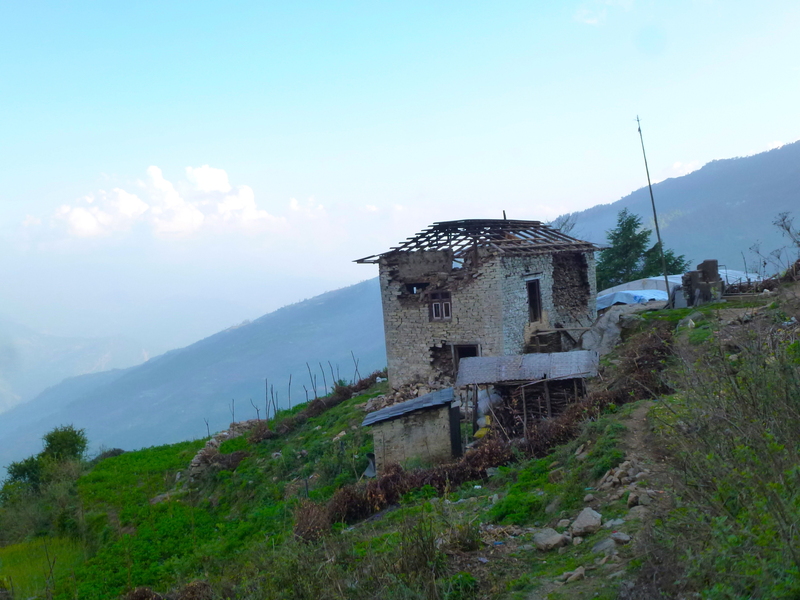 To learn about the Goli Village Support Trek, click here. 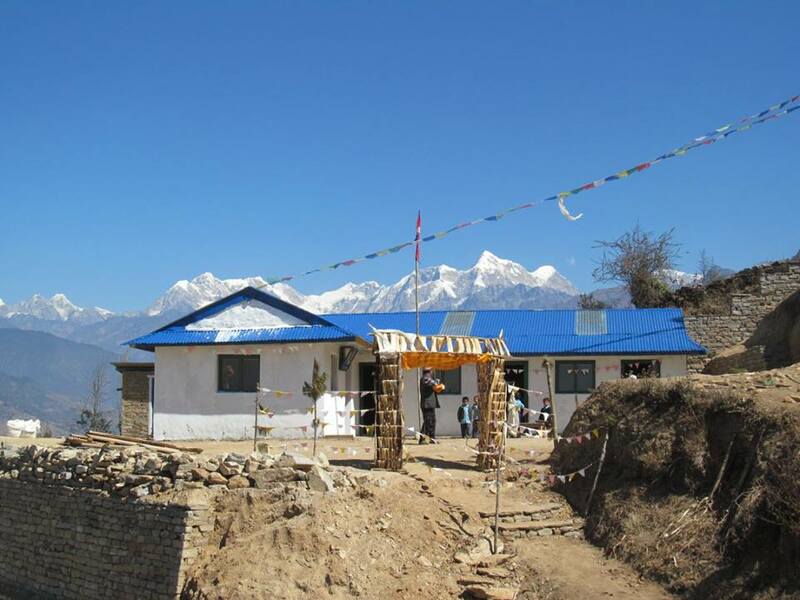 Donate to the rebuilding of Goli Village here.